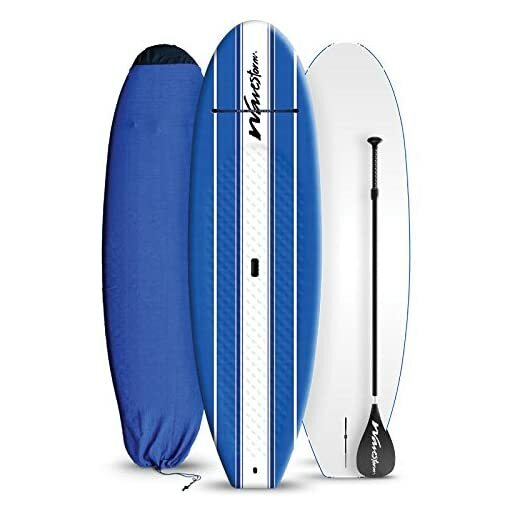 Anniversary Graphic The WavestormTM 9’6″ Anniversary Stand Up Paddle Board has been designed for greater maneuverability. At 195 litres volume it’s suitable for riders up to 250lbs. With an even distribution of surface area the 9’6″ SUP has great stability & is easy to control. Suitable in both surf & flat water conditions the ingress traction pad adds sure-footed grip. Features an EPS core with 3 x Marine-ply stringers, ingress carry handle, accessory strap, textured IXL GFTTM Graphic Film decking for comfort & resilient HDPE bottom skin. Includes single Built in fin box with removable 9″ OA Flat Water fin, Adjustable Paddle, leash, and soft protective board sock.